Home » Griddles, Grills & Fryers » Electric Grills » What is the Best Indoor Grill for Steaks? What is the Best Indoor Grill for Steaks? Barbecues and grilled meals are great for singles, couples, and families all year round. This is because they are quick, tasty, and easy to prepare, provided one has the perfect grill. You can find thousands of recipes for grilling online – steak, poultry, fish, pork, vegetables, and while grilling a perfect steak might be tougher than a simple set of instructions, one thing all the experts agree on is that a good grill goes a long way. However, if you live in an apartment, don’t have a backyard or just want grilled food in the middle of winter, you’ll need to do it indoors. So, what is the best indoor grill for steaks and what should you look for? First is the size. Steaks have a large surface area and should not be crowded on the cooking area. You therefore need a grill that can easily cook at least two full sized steaks. Secondly, the grill should go up to high temperatures (450-500 degrees Fahrenheit) to enable searing in the beginning to seal the juices and flavour in before you can lower the temperature to finish cooking the meat through. Steaks have a high fat content and a good grill should reduce splatter and smoke, either through a water tray or drip pan to catch the excess fat at the bottom. Lastly, an indoor grill with removable plates is best for easy cleaning, while a well designed and long lasting one will give you plenty of reasons to use it frequently. This guide offers you 5 of the best indoor electric grill options, with summaries on the cooking surface area, temperature range, price, basic features, washability, and versatility. What grill list wouldn’t include a George Foreman, right? Our pick for an indoor electric model that’s good for steaks is the 2-in-1 Evolve Grill which costs around $100-$120. This indoor grill with removable non-stick ceramic coated plates for grilling is durable and long lasting. You can change the grill plates out for waffle making plates or leave the lid open and flat for other tasks like grilling sandwiches or veggies. The surface is 11 1/2″ wide by 7 1/2″ deep. Use the digital control panel to adjust cooking times and temperatures which range from 300 to 450 degrees for normal grilling. It also has a sear function that cooks at 500 degrees for a few minutes – perfect for grilling steaks to seal in the flavour and juices before lowering to cook the meat through. It is also the best indoor grill for chicken, as 4 to 5 servings can be cooked to perfection in about 12 minutes! To allow the fat to drain, use the tilt control to adjust the angle of the grill. The floating hinge lets you maintain uniform thickness on all the food when the lid is closed. The removable plates are dishwasher safe so clean up is easy. If the two included plates are not enough for you, there are additional ones like baking and muffin pans that you can buy to fit perfectly into the frame. One thing to watch out for is that this grill will take a bit of time to reach the searing temperature and once it does you have to immediately place your meats on the plates as it starts counting down as soon as it beeps its alert. If you take too long to start grilling, the meat may not get enough searing time. This type of floating lid grill is also great as a panini press. The Hamilton Beach Indoor Flavor/Searing Grill is an efficient indoor grill that can deliver outdoor grill results at a low price of around $60-$80. It heats up quickly to 450 degrees and also features easy-to-use adjustable temperature controls, indicator lights for power and pre-heating, and a non-stick plate. The grill is large and well designed with a 9” by 9” grilling space and 3” by 9” warming space. It offers a generous drip pan, which ensures healthy cooking and no excess fat accumulation but you should make sure that there’s lots of ventilation when in use because meat grilling will create lots of smoke. The plate, hood and drip tray are all removable and dishwasher safe so cleaning is extra easy. Furthermore, users appreciate the ease of use. One thing to note, however, is that the 25360 does not have an upper grill but comes with a hood. This means that you have to turn the steak over when one side is cooked. Once the searing is done, the grill automatically lowers the temperature to what you set beforehand but there is no timer, so don’t leave the food on and walk away! Weighing less than 11 pounds, the Delonghi Perfecto Indoor Grill with lid is quite portable, and with cool touch handles, it makes this the best table top grill available for picnics and tail gating. The BG24 has an extra-large surface area (12 by 6 inches) which means it can easily accommodate bulk grilling. The cooking surface is die-cast aluminium, and it has a detachable and adjustable thermostat, which ensures quality results and long lasting use. Customers appreciate the BG24’s tempered glass lid which contains heat and splatter. The indented surface also ensures that there are fewer spatters when grilling. Furthermore, the removable parts, including the grill plate and drip tray, make for easy and convenient cleaning. Just make sure to detach the thermostat from the grill plate before putting it into the dishwasher. Its price ranges from $50-$112. Some concerns raised by customers about the Delonghi BG24 are that it has an open bottom design which causes the BG24 to heat up slowly, and lose some heat. This compromises its searing capability and the longer cooking time dries the meat up. To minimize this issue, wait for the grill to reach its desired high temperature before placing food on it. While the glass lid can contain heat loss, it would also trap moisture. However, the grill plate heating element is M shaped and fully embedded so the food cooks evenly with no hot or cold spots. 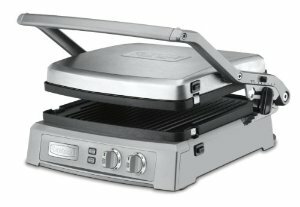 If you’re looking for an indoor grill and griddle combination that boasts more features and versatility, the Cuisinart GR-150 Griddler Deluxe in brushed stainless steel offers you six cooking options in one device by utilizing the bottom plate and the top plate. It comes with a contact grill, a Panini press, a full griddle, a half griddle, a full grill, a half grill, and a top melt facility. The top plate adjusts to 6 different heights for this feature. It can sear at 500 degrees for up to two minutes on the SearBlast feature to ensure that your meat is grilled to perfection. Its grilling surface is 240 square inches (open) which means you can cater for a large group as well. This grill also comes with dual zone temperature controls, which offers you the convenience of preparing separate foods on each plate, at separate temperatures. A nice safety feature is the automatic shut off if the unit is left on for more than 2 hours. The non-stick plates are removable and reversible, dishwasher safe and easy to clean and so is the integrated drip tray. A locking feature for the top makes storage easy. Its price ranges from $140-$200 so it’s not cheap, but its extra features, unparalleled versatility and inclusion of a cleaning/scraping tool makes it the best indoor electric grill for steaks. Users of the GR-150 rate it very highly. It can be easily used by singles, couples, or even for preparing large family meals. The temperature controls also facilitate efficient use, as you know when the grill has heated up and how long to leave the food in the grill without burning it. Some of the concerns raised were regarding the large size, which makes it difficult to use and store in small spaces. Some customers also find it complicated to set up and use, even with a manual, which can cause some inconvenience, particularly when removing parts for cleaning. The Zojirushi Electric Grill costs between $70 and $100, has a surface area of 12½ by 9¼ inches and can grill everything from steaks to chicken, fish, burgers, and vegetables. Although this grill reaches a maximum temperature of just 410 degrees F, it is made of durable cast iron, which is perfect for grilling steaks. It also creates almost no smoke or splatter and is coated with a non-stick surface which accommodates low-fat cooking and is quite convenient to clean. The EV-CC15 also features some efficient safety measures: a stay-cool plastic base, cool touch handles and heat controls which also assure precision when cooking. This plastic base means that your table-tops are safe making it one of the most popular table-top grills. The grill cannot operate without the drip pan and grill plate in place as the heat control cannot be inserted without them. The grill plate also cannot be removed unless the heat control, which enables power to be turned on, is in place. The EC-CC15’s cast iron material means that it heats up quickly and contains this heat long enough to grill your steaks very fast. It also does not smoke, which makes it a very good one for indoor use. It is, however, open top style with no lid so you have to flip your food at least midway and food that is cooked will not stay warm for very long once the grill is turned off. The EBCC15 also makes for easy cleaning as its parts can be quickly disassembled for cleaning. The drip tray is also dishwasher safe, though other parts are not. Customers however complained about the hassle of cleaning these other parts.